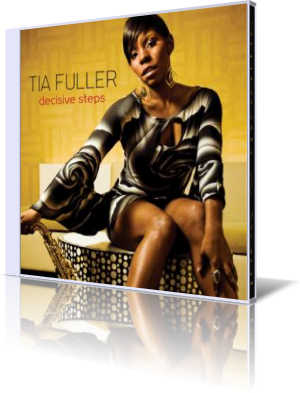 When I saw the cover of Decisive Steps first time, I assumed to have a smooth jazz album in my hand with some urban elements. Far from it! Although Tia Fuller is a member of the all-female band touring with R&B star, Beyoncé and a featured soloist on the Beyoncé Experience DVD (Me, Myself and I) and also appeared on number of major television shows, such as The Oprah Winfrey Show, Today Show, Good Morning America, BET Awards, American Music Awards and Total Request Live, her own music is deeply rooted in jazz. Tia Fuller's album party is joined by drummer Kim Thompson; bassist Miriam Sullivan; Tia’s sister, Shamie Royston on piano and Fender Rhodes; with special guests, trumpeter Sean Jones and bassist Christian McBride (both Mack Avenue label mates); vibraphonist Warren Wolf; and tap dancer Maurice Chestnut. Starter of the album is Decisive Steps, a straight ahead jazz tune, presenting Tia's sax performance with great verve and elegance. She clarifies her own style, grounded right between Cannonball Adderly and John Coltrane. Windsoar was created by Shamie in B-Flat, opening the platform for Tia's escapades in sax and Sean Jones' on trumpet. Ebb & Flow is like an outburst of the elements. Tia Fuller performs the sax with upmost brutal force and drummer Kim Thompson sets precise counter beats. On I Can't Get Started Tia Fuller shares a beautiful melody with Warren Wolf on vibes and Christian McBride on bass. Even the muted mood is pleasurable. Kissed By The Sun could also be entitled kissed by the muses. This is a tune for the horns and the players Tia Fuller and Sean Jones are just phenomenal. The interlude Steppin' featuring tap dancer Maurice Chestnut is just, what the title describes. Legendary American jazz bassist Christian McBride performed with the best jazz artists of the past century and is Tia Fuller's idol. Shades Of McBride, following the melody of The Shade Of The Cedar Tree taken from his album Kind Of Brown (2009), is an homage to Christian McBride and his work. On Clear Mind Tia Fuller exposes the great talent of vibraphonist Warren Wolf. By the way there is no gap between all musicians. A tight band. Most of today's sax player also perform the flute as second instrument. Night Glow is a tune about the acoustic side of the group with piano, acoustic bass and flute in the first line. My Shining Hour (1943) is a song composed by Harold Arlen, with lyrics by Johnny Mercer. Tia Fuller excels in a dramatic sax solo far beyond the melody pushed by Kim Thompson's fulminate beats. Tia Fuller already performed with a number of luminaries in the world of jazz. After listening to her album Decisive Steps the reason is evident. She is a full-blooded jazz musician.